We had a blockbuster panel at the IFN studio for this Tuesday's Adda With Kalyan. The buzz was so electric that even the cameras couldn't keep up with the speakers at times. The smiles were really broad. The chemistry unbelievable. The topic was Mumbai's dining out history. 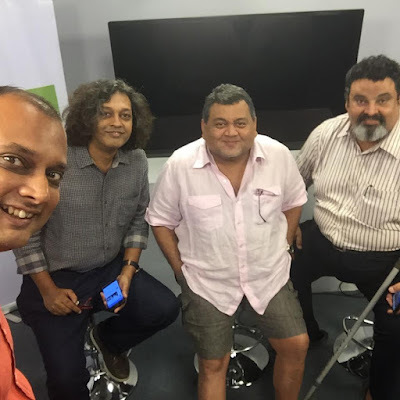 We had Mumbai's favourite foodie, Kunal Vijayakar, archaeologist and caterer, Kurush Dalal and food journalist, Antoine Lewis. We probably had some of the most respected figures in Mumbai's food media in the room with us that evening. Kunal and Kurush are romantics at heart and often giving a counterpoint to them was Antoine who is a seasoned industry watcher. The topics ranged from Irani cafes to the community based inns or khanavals that preceded them to whether the disappearance of béchamel sauce is a good thing to that 'confounding thing' called chicken bacon and to fond memories of restaurants with dance floor. It pained me to bring this talk to a close but the we will back together as a group again I am sure. Here's the video and hope you enjoy it as much as we did. Yaar, who is Atoine ? Restaurant in Parsi Colony was Yazdir and at Dadar Kodadad Circle was Yazdan. Both are closed now.